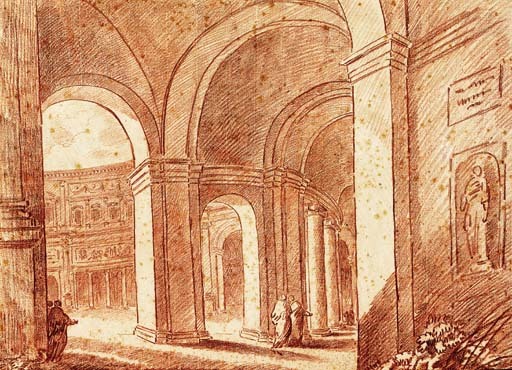 Probably an early Roman work comparable in the handling of the chalk and the arrangement of perspective to the artist's drawings of 1757 at Valence and in the Louvre, J. de Cayeux, Les Hubert Robert de la Collection Veyrenc au Musée de Valence, Valence, 1985, no. 1 and fig. 6 respectively. A weaker version of the same composition was sold at Sotheby's London, 7 July 1999, lot 63.